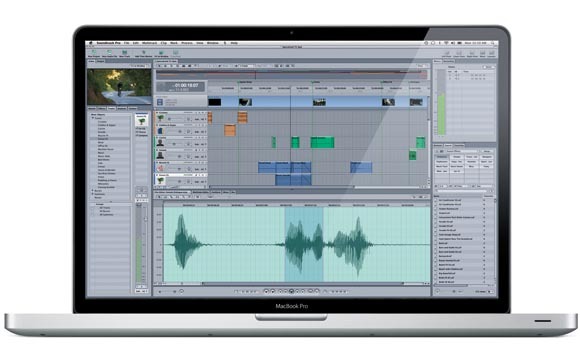 Apple has released Logic Studio 9 today. Banner features: “Flex Time” audio warping, new goodies for guitarists (plus integration with a new audio interface and pedalboard from Apogee), expanded support for working with video and outputting compression, and most interestingly, tools for making MainStage a feature you might actually take onstage. I’m meeting with Apple next week, so if you think of any smart questions, do pass them along. I should receive my testing copy then, too, so expect more details. In the meantime, here’s how it looks “on paper,” in a nutshell. MainStage needs a way of playing backing tracks, particularly for bands and acoustic players and soloists. ReWire is a must, so people using tools like Ableton Live (or Reason, or the awesome tracker Renoise) can work with them in a MainStage rig. Better control mapping was needed for real performance – including grouping. Musicians need a way of recording their gigs. Well, guess what? Apple says they’ve added all of that to MainStage 2. ReWire support should make this particularly interesting, as solutions like a Logic-Live rig now become practical. 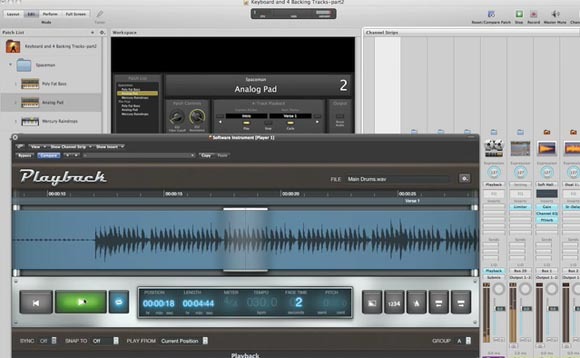 And this is the first DAW to really try to do backing tracks in a way bands can use, even including Ableton Live. Grouped controls allow you to drag and drop layouts of controls as macros. It’s a nice implementation, and different from what’s currently out there. There’s also a live loop recorder, tape style. My first impression of this is that this doesn’t appear to match things like the new looper in Ableton Live 8, which can set an entire project tempo – it’s more like a basic stompbox effect, as we’ve seen previously in Native Instruments’ Guitar Rig. Still, that matches the simplicity of some of the other tools here. Augh… and yes, that is Apple’s now-ubiquitous album art view as the browser mechanism for templates, proving they really don’t know where to stop. At least it seems they haven’t used that for the entire UI. Of course, performance is everything in these implementations, so it’ll be fun to torture test MainStage 2 and see how it stands up. And for anyone who wanted Live clips and Sculpture in one session, this could be interesting. 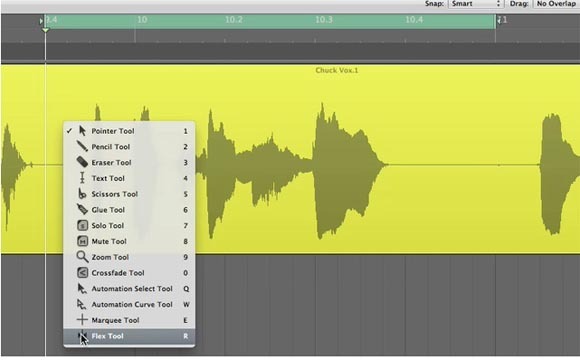 The music software market is already crowded with tools that promise to let you manipulate audio independent of its original tempo – but this implementation is more interesting than you might first think. You actually drag the mouse on the waveform itself, turning the sound into a Silly Putty-like, warpable view. Very much like Ableton Live, Logic also adds modes based on material (rhythmic, polyphonic, slicing), and an audio quantize mode that applies the feel of one track to another. There’s also a slightly gimmicky record start/stop effect, which I’m sure will be a boon to anyone doing editing for MTV. But make no mistake about it: Flex Time could heat things up. 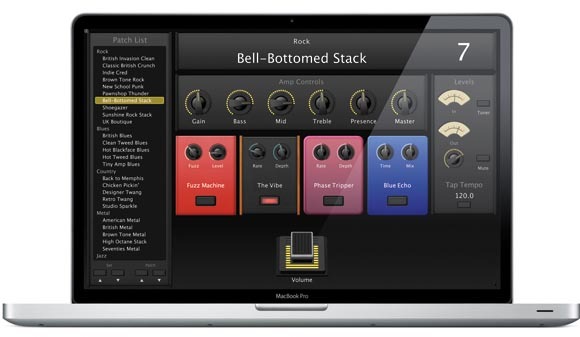 Apple is obviously committed to providing a one box solution, so you never have to buy anything for music making that doesn’t have an Apple logo on it – something I’m sure doesn’t make Native Instruments, Waves, IK Multimedia, and other competitors exactly thrilled. Those solutions are already really good, but I have heard Apple’s implementation is quite nice, and I’ve heard it from people who are actual guitarists. Ornaments have been expanded with a broader notation library, and a set of some 4000 chord grids beef up tab capabilities for guitars. I still think you’d be nuts to use Logic in place of something like Sibelius for major notation editing, just because I find the dedicated tool much quicker to use. On the other hand, Logic was born as “Notator,” so it has notation in its blood. There’s also a new browser for instruments, it appears, apparently to make this more accessible to new users. On the other hand, that’s a bit like holding a toddler’s hand before putting him in the seat of your Ferrari, when it comes to interfaces like Ultrabeat. (See what I mean on Apple’s site.) But I suppose it can’t hurt – and meanwhile, the market for educational products remains. As near as I can tell, Logic will not support 64-bit memory addressing or 64-bit mixing. The former is extremely unfortunate for users of big sample libraries, although third-party tools do fill some of that gap. (Even so, native 64-bit memory support would be welcome.) It’s possible we may see this in an update, however; if it’s “in the future,” we just won’t know because Apple makes a policy of commenting only once things are released. Also, it appears that Logic’s increasingly long-in-the-tooth library of effects and synths — once part of the core appeal of the tool — are left as-is in this release, which would be unfortunate. On the other hand, with options like Native Instruments’ Komplete to fill that need, and a price of US$499, it’ll be hard to fault Apple on this. Many folks expected some sort of iPhone / iPod touch app, given that third parties have built them for control and the like. They were wrong, but I’m not surprised — Apple likes to keep its consumer and pro features fairly separate. Any other omissions you notice, or things you’d like me to ask about? Let me know. At least I have a fairly decent working list for what I’m likely to be hard at work testing when this arrives in the mail. And Logic has some intense competition, too, with even a new entry on the scene this year (Propellerhead’s Record).